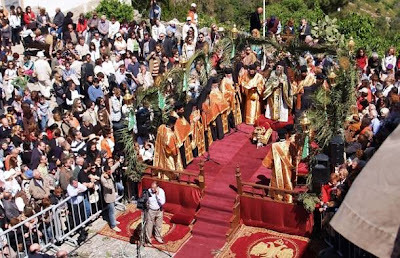 Shortly before noon in the main church of the Monastery of St. John the Theologian, twelve priests and monks dressed with similar porphyry-gold Byzantine vestments, together with the castle bells chiming to the rhythm of the sacred moments of the 50th Psalm in a plagal tone, are ready to follow the Patmian Typikon in a rare event. The author I. M. Hatzifotis informs us: "The ceremony of the Sacred Niptira belongs to the category of authentic Byzantine representations of the Passion which was spread to the West, having the distinctive name of 'Mystery'." This ceremony began, according to Professor Phaedon Koukoule, "in the beginnings of the 4th century as an 'antithesis' to the theater which praised the twelve gods and was an endearing spectacle to the people of the time." It is included in the Typikon of St. Savvas and has been performed at least since the 11th century when the Monastery of Patmos was founded, either in the main church or the courtyard. For details about the ceremony, read The Ceremony of the Washing of the Feet on the Holy Island of Patmos.